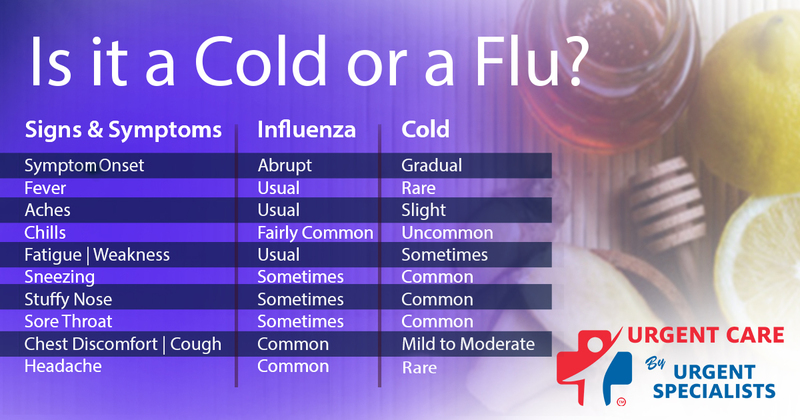 There is a lot of confusion over knowing whether you have the flu or cold and how they are treated. There is even the possibility that the condition is sinusitis. Urgent Specialists can help evaluation your situation. When there is a condition of sinusitis the symptom onset is progressive. There is almost never a fever. Aches and chills are unusual, but fatigue and weakness can happen. Sneezing is rare, but a stuffy nose and sore throat are frequently present. There can even be chest discomfort and headaches. With a rapid flu test you can tell if you have the flu and treat for it in as little as 15 minutes. What does this mean to you regrading treatment? Do you need antibiotics? Answer is only if you have sinusitis. This is because the flu and colds are caused by viruses, neither of which need to be treated with antibiotics. When people get antibiotics, they are being treated for sinusitis. The #1 reason an antibiotic is written is for a sinusitis. So, at this time of year, often the presumption is that the individual has a sinusitis. This is the problem with over prescription; however, viral infections can precede a sinus infection. Causes of acold: rhinovirus (over 50% of cases), then coronavirus and respiratory syncytial virus (RSV). Influenza: There are A and B forms discussed in our article posted on H1N1, but these forms are still a virus, but often present more severe symptoms. Sinusitis: Streptococcus pneumonia, Moraxella Catarrhalis and Haemophillus influenza are the most common. There are many others that can be best identified with a culture. When concerned about your condition, visit Urgent Specialists. Open 7 days a week. With a rapid flu test you can tell if you have the flu and treat for it in as little as 15 minutes.